If you have a hardwood floor, you may have noticed what a beautiful gift it brought to your home. However, you may be in the market for hardwood refinishing in Bergen County NJ. There are many reasons to consider this rejuvenating service. Some of the most common customer concerns are listed below. Whether or not you fit into one of these categories, we can offer you something you never thought possible. That is, a new floor without having to get a new one installed. 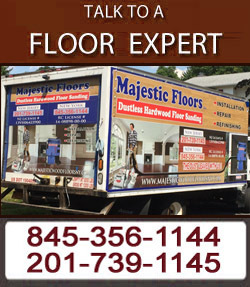 Majestic Floors performs expert hardwood refinishing in Bergen County NJ. Our trained and professional hardwood specialists work without delay to update floors in your home, giving it a shining, attractive appearance. With hardwood refinishing, your home will benefit from more natural light, less dust and dirt particles, and a smooth surface that feels great. Our refinishing service brings renewed life to your floors and value to your home. The majority of our customers come to us for repair work. As is the case with anything else, time can wear down a hardwood floor and leave it showing signs of damage. These include cracks, splits, peels, and more. Even general fading is a problem for some. We can come into your home, and in no time at all, bring new life to every floor board in you have inside with professional hardwood refinishing in Bergen County NJ. All without bringing out a stock of new boards from the truck. Another common reason for hardwood floor refinishing is changing the look of the floor itself. Part of the beauty of hardwood is the many color and style options that are available for the home. You can change the scheme and keep your current floor. Say you want a darker color? Or one that matches your new furniture? Anything is possible. Aside from repair and design, you may want to strengthen the floor itself. Consider hardwood refinishing in Bergen County NJ like your floor's regular check-up. These boards are incredibly versatile under normal conditions. But after a little elbow grease, they can become virtually indestructible. Enamel, coating, and other protections will keep your floor in its current, gorgeous state for longer than you ever imagined. For more information about hardwood refinishing in Bergen County NJ, call Majestic Floors at (201) 739-1145. Human beings have made many advancements in the course of our development. Our homes have followed suit and come into modernity with great success. One of the beautiful aspects of our design is how we often incorporate nature with a man made touch. In no place in the home is this more prevalent than in the hardwood floors. These floors are not only elegant, they are a wonderful centerpiece in your home for both the eyes and beneath your feet. That is, unless there are serious issues with your current hardwood floor. In which case, you don't have to worry. Our professional specialists will revitalize your home with wood floor sanding in Franklin Lakes NJ. At Majestic Floors, our hardwood specialists have been rejuvenating floors and home value for years. Our experts are fully trained, knowledgeable, and ready to liven up your floor without delay. We take great care to achieve beautiful results, and our dustless wood floor sanding in Franklin Lakes NJ is 99.9% effective at clearing dust particles as small as .5 microns. When you call our professionals to restore your hardwood floors, you'll get the look you're looking for, at the price within your budget, with minimal cleanup and little maintenance required afterwards. No matter how bad of a state your floor is currently in, there is hope. We perform wood floor sanding in Franklin Lakes NJ to get your floors shining without delay. This gives you a brand-new looking hardwood floor without the need of fresh installation that can become costly. Instead, our wood floor sanding is both quick and easy on the wallet. Our experts can repair the biggest cracks, tears, splits, and seams. What we provide is an open canvas that allows you to mold the floor however you see fit with a refinishing or fresh color. It's only normal that the floor take damage over the course of its lifespan. You are living in your home, after all, and things happen. But this doesn't mean the end of the floor. Instead, see it as a new beginning. There are numerous reasons to choose professional wood floor sanding in Franklin Lakes NJ. The most obvious is repair. But another option is changing the look and feel of the wood boards. You may have grown tired of the current floor and want something new. We have just what you're looking for. For more information about our expert wood floor sanding in Franklin Lakes NJ, call Majestic Floors at (845) 356-1144.